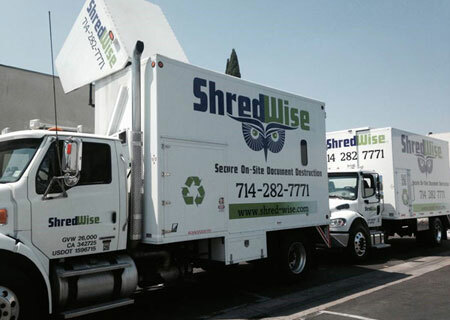 Shred Wise Inc. serves healthcare providers, such as doctors, dentists, clinics, nursing homes, psychologists, and pharmacies; health insurance companies; government healthcare programs; and medical billers throughout Orange County who need secure, reliable, and cost-effective shredding services. Our document destruction services help them comply with HIPAA (Health Insurance Portability and Accountability Act), FACTA (Fair and Accurate Credit Transactions Act), and other local and federal laws that have been put in place to protect the privacy of patients, consumers, and employees. Having worked with those in the healthcare industry for nearly a decade, we know how to support their specific document destruction needs. Shred Wise is committed to following the NAID Code of Ethics, staying up to date with all privacy law requirements, and integrating their recommended best practices for document destruction into our mobile shredding services. We use state-of-the-art shred trucks with automated lift arms and onboard shred cameras; supply our ongoing clients with lockable shred consoles and rolling bins; and keep all sensitive documents secure throughout the shredding process. With every visit, you will be invited to witness the shredding process and be given a Certificate of Destruction for your records. Everyone who works at Shred Wise has been carefully screened and thoroughly trained, and will be the only individuals to handle and transport your sensitive materials. They are exceptionally knowledgeable, and are happy to help our clients create a records retention schedule, promote employee compliance, and find the best paper shredding solution for their needs. Call licensed, bonded, and insured Shred Wise today for custom paper shredding services that meet your health care facility’s document destruction needs in Orange County. We offer ongoing, regularly scheduled on-site shredding services on a month-to-month basis as well as as-needed shredding through our drop-off or mobile service. We’ll even handle the secure destruction of cds, dvds, and hard drives. Shred Wise Inc. also frequently serves the needs of veterinarians and veterinary hospitals. While animals, such as pets and livestock, are not covered by HIPAA, there are protections in place that veterinary offices need to be aware of. In California, for example, medical information may be shared between veterinarians or vet facilities, but may not be disclosed otherwise without the consent of the client or by court order. Unauthorized release of records are subject to criminal penalties. As such, it is critical that they take the necessary precautions to keep the information of their patients secure until they need to be properly destroyed. If your veterinary office, clinic, or hospital in Orange County needs shredding services, call us today for a free quote.